Cambria used to be a town where nothing much happened, and the town's leaders and most residents liked it that way. "About 90 percent of the town consists of residences and farms and has been existing that way for as long as any of us can remember," said Gary Billingsley, Cambria's planning and zoning attorney. But in recent years, Cambria began to be known for another reason: its wineries. Local farmers started some as they looked to diversify and keep their land in the family. Investors opened others, taking advantage of land in the shadow of the Niagara Escarpment, where the microclimate fosters excellent grape production. Cambria's seven wineries are now a popular part of the Niagara Wine Trail. But not everyone seems pleased by what also followed, pointing to what they call bothersome traffic and noise as well as boorish visitors at times. Last month, the Town Board adopted regulations on special events and the construction of wineries and other facilities that produce adult beverages in agricultural-residential zones. The new rules limit crowds at promotional events to 250 people, unless it's a Wine Trail event or private party. No new building at a winery can be closer than 125 feet to a road. And any transfer of ownership must be approved by the town, unless it's within the family. "We never dreamed of things getting to this point," said Wright H. Ellis, town supervisor since 1992. "Now, the town has more people. We’re almost 6,000 people, so you've got more houses and we have to listen to those people, try to find a balance between them and the farms." The restrictions ignited a backlash from the wineries. "When we were looking for a place to open our distillery, if these laws were in place at that time, we wouldn’t be there," said Todd Snyder, owner of Niagara Craft Spirits, at a public hearing just before the board passed the new rules. The tension over wineries comes against a backdrop of other development pressures, namely solar arrays, but also housing and even a sunflower field that attracted visitors. Snyder warned of "unintended consequences" if the town's rules lead to wineries and farms going under. 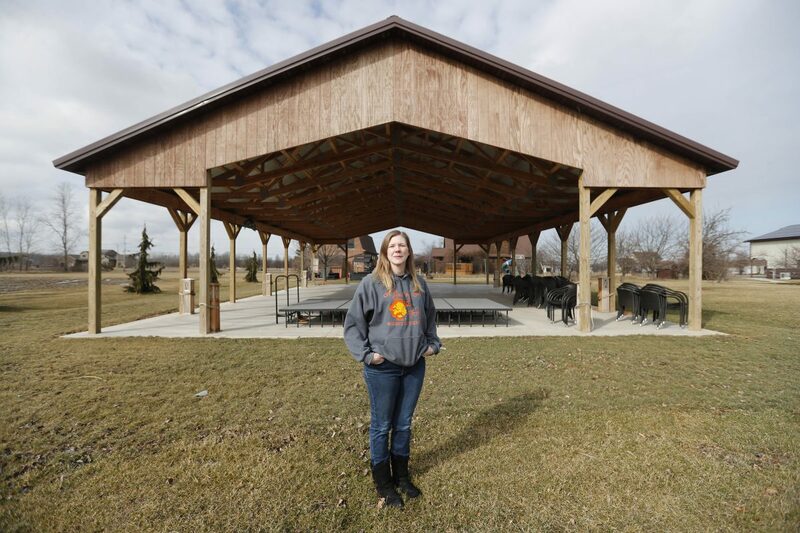 "When you take away the ability of someone to pay their bills, I don’t know where you think that’s going to lead to, but I think probably what it’s going to lead to is a lot more housing developments," Snyder said. "I live in Amherst, and I love coming to Cambria, because you drive down the road and it’s not a stoplight every 50 feet. If you want to see what you’re headed for, you might head down there and drive around a little bit during rush hour and see what it’s like. I hope Cambria doesn’t turn into that." The new winery regulations passed by a 3-2 vote. Ellis voted no, but only because he wanted the board to wait a month and change some provisions. Winery owner Shane Gustafson feels targeted by the new rules, which she said were inspired by one of her Baer Road neighbors who doesn't approve of her winery. She decided to run against Ellis in the Republican primary for supervisor. A Gust of Sun, the winery owned by Gustafson, is the only one the town has received complaints about, Ellis said. "There’s cars turning around in our driveway, some going directly on my front lawn and turning around," neighbor Timothy McInnis said at the hearing. "Customers of theirs have been seen by neighbors vomiting and relieving themselves in the yard. Individuals on a bus have exposed themselves to a neighbor. Last summer an individual was passed out on a neighbor’s lawn on a Sunday afternoon. An individual whistling at my teenage daughter from a bus while outside. Examples could go on and on." McInnis also complained about the live music events at A Gust of Sun. "It makes it very disturbing to sit in our yard, or, if we’re in the house, to have to close the windows in the summertime," he said. "On weekends, this occurs during the daytime and evening. It is a quality of life issue." Erik Gustafson, Shane's husband, called the complaints exaggerated. "Nothing could be right to these neighbors," Erik Gustafson said. "It is a pattern of opposition or obstructionism at any cause. They’ve shown a repeated pattern of stretching the truth and exaggerating the truth to make it seem like, when isolated incidents occur, that this is something that happens all the time at our place, when nothing really could be further from the truth." Erik Gustafson said he took a sound meter to a neighbor's house during a concert last summer and got a reading of 50 decibels, which he said equates to a "quiet library." Nonetheless, the neighbors came in complaining that their windows were rattling and they had to sit in their basement with earplugs, he said. Winery owners see their vineyards as a way of preserving the town's rural heritage through agriculture-based businesses. 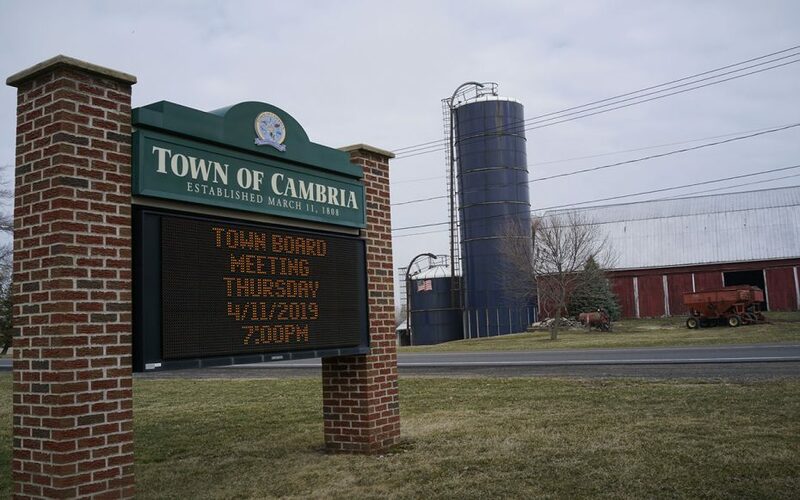 "When the farms and big plots of land sell in Cambria, they will become houses, and once they become homes, the beauty of our town will be destroyed," Shane Gustafson said. "The agricultural background will be destroyed and the rural community will be destroyed." Shane Gustafson moved to Cambria from Monroe County to start her winery. Some winery owners see the changes as a threat to their operations and even to their ability to bequeath their businesses and land to their children. "From my perspective, that makes it difficult to sell the property. It reduces the value," said Robin Ross, co-owner of Arrowhead Spring Vineyards. Billingsley said the town wouldn't enforce the transfer approval clause for a family transfer and intends to change it formally at the April 11 board meeting. The town supervisor struck an optimistic tone even as the board passed the new rules last month. "Anybody wants to come in here, more power to them," Ellis said. "God bless you, and let’s go on with it. It doesn’t prohibit anybody." But the wineries remain skeptical. "You all said the same thing: ‘Don’t worry about it. You’re not the problem. It’ll be fine,' " Snyder told the Town Board. "I can’t plan a business based on that. I can’t plan an expansion. Twenty years from now, if this code is on the books, somebody else might misinterpret it and I get a cease-and-desist." That's what happened last September to another agri-tourism effort in Cambria. Sunflowers of Sanborn started in 2017 as a field of sunflowers along Route 31 where people would stop and take photos. The farmers, Chad and Louise Brachmann, planted the field on their century-old Cambria farm in memory of Louise's parents. Last year, they added food and other vendors. The town, noting the field's location in a single-family residential zone, deemed it an illegal business. "Farming is not the most lucrative thing," Louise Brachmann said. "Once the sunflower field caught on, we decided to try to turn it into some equity." "Now you’re getting into a full-blown biz separate from your agricultural business," Ellis said, explaining why the town intervened. There had been complaints from neighbors the previous year about traffic and parking on the shoulders of the road, leading the Brachmanns to build a parking lot for 2018. "Anytime anybody brings in anything that might make a little revenue, they're saying, 'Well, we don't want to offend our residents,' " said Ross, the Arrowhead Spring Vineyards co-owner. "We are farm-friendly, we are business-friendly," Councilman Matthew P. Foe said. "We worked with Chad and Louise. We may have a remedy now on the sunflowers. We’re not going to go out on a limb on it. It was a bad thing that happened and it was very unfortunate. I don’t think there’s a single member of this board that doesn’t agree with that." The town supervisor doesn't accept Shane Gustafson's warning that "the land's all going to be subdivided and turned into houses" if the town turns against wineries. "It's not going to happen," Ellis said. Cambria has no sewer lines below the escarpment, so large-scale residential development is difficult at best, he said, although individual lots continue to sell to people willing to install septic tanks. Some landowners see another way forward. About 750 acres of open land in Cambria is under contract for lease to a California company for a giant solar power development. Ellis and other town leaders have doubts about that project, but because of state laws that favor renewable energy, the town may not be able to stop it. "We are concerned about the loss of viable farmland and the adverse impact on property values in the area near the proposed project," Ellis said. "Trying to shoehorn a utility-scale energy facility into a mixed use, residential and agricultural town, that has many parcels, many landowners and a wide range of resident expectations is causing much angst among our citizens and much concern for the Town Board. The Town of Cambria is a nice place to live and raise a family. We would like to keep it that way." Foe said people who buy property in an agricultural-residential zone "have an expectation of what their neighbors are going to look like." He said his goal is "to protect the other people in the community that are here and do not want to have spot zoning-sited places next to their house." "We feel that we’re happy to have more wineries," Ellis said. "We represent the entire town, the entire community. We listen to the neighbors when people bring up issues."